NI’s Flexlogger is a configuration-based data-logging software for validation tests. It enables sensor configuration and data logging of mixed signals to verify electromechanical systems, all without programming. 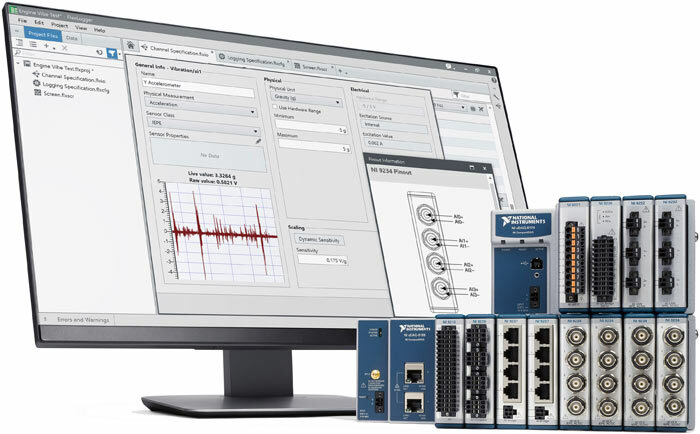 Engineers can use the product to help simplify test configurations and extract key insights with sensor-specific workflows to acquire and log synchronized, mixed measurements. They can integrate analog sensors, digital pulse frequencies, CAN signals, and calculated channels that are all logged to the universal Technical Data Management Streaming file format. So data can be correlated and analyzed to characterize an entire system. These capabilities also address similar challenges faced by test departments in other industries including heavy equipment, aerospace, appliances, and academic research. Each system has unique specifications for functionality and performance, which means every test has different requirements to integrate new sensors and industrial protocols. “Characterizing a combine harvester drivetrain requires a mix of different measurements including pressure, temperature, current, CAN, and shaft speed,” said Andy Tarman, lab test engineer at CNH Industrial. “Flexlogger makes it easier to troubleshoot and verify that the raw data from different sensors are correct before I start my test. This helps shorten test development by saving time typically wasted on redoing configurations." The data-logger software automatically logs descriptive metadata about the test configuration including sensor and hardware acquisition settings. Test departments can improve access to data and communicate results to the organization using Diadem data management software to find, analyze, and report data on Flexlogger.